Regardless of the circumstances, Asterion is committed to supporting each ounce of chemistry that leaves its facility. While there are many ways we support our customers, sample analysis is arguably the most useful and efficient form of technical support a chemical supplier can offer. And as hard as it may be to believe, many chemical suppliers do not provide any free technical support or laboratory analysis. I’m pleased to note that this is not the case with Asterion. Our sample analysis process, while detail-oriented and comprehensive, is designed with timeliness and accuracy in mind. There are many reasons customers send us their samples with confidence, including the capabilities and services detailed below. Asterion’s surface finishing processes are flexible and forgiving. On the rare occasion that problems arise, Asterion chemically analyzes what may be an out-of-balance bath. In most cases, it’s an easy fix for customers, most often requiring a cut or an addition of a certain bath component. Occasionally, chemical analysis may also identify the presence of a foreign material in the bath. This material may ultimately be the culprit. Customers may also submit samples to our laboratory for routine analysis. In this scenario, we analyze the bath to help identify areas that could use improvement. For example, a hypothetical customer could submit a sample of a bright nickel bath. The bath may be producing beautiful work, but, unbeknownst to the customer, the bath is low in nickel metal. With this information, Asterion would make a recommendation to increase the nickel metal concentration, which, ultimately, could improve appearance in the high-current density. No one likes to dump their old baths. Therefore, we do everything within our power to save as much existing material as possible. 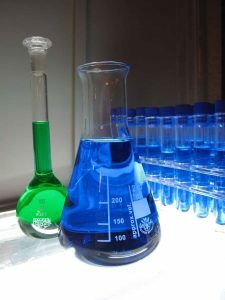 More often than not, customers are able to salvage the chemistry they already have in their facility. Prospective customers are encouraged to submit a sample to the laboratory for conversion. Once we obtain a basic understanding of the bath’s chemistry, the sample is then analyzed in a Hull cell. Often, upon completion of analysis, we will make a chemical or process recommendation to bring the bath up to speed. Once fully converted to Asterion’s process, scheduled additions are recommended on an amp-hour basis, and the process will operate as designed. We know that when customers hear about any procedure regarding sample analysis, most would assume that it could take weeks to obtain results. Not so with Asterion! Last September, we implemented a user-friendly, online sample submission process that continues to receive overwhelmingly positive feedback. Designed to ensure ease-of-use and quick (within days!) customer response, the submission process expertly organizes sample submissions for laboratory analysis. Upon providing a few basic responses, the customer is assigned a unique identifier number for each group of samples submitted. Using this number, they are able to track the sample from submission to completion. Additionally, we can easily retrieve earlier sample reports should the need arise in the future. You can feel confident when sending Asterion your samples. Our analytical laboratory performs a range of chemical analysis that complies with industry standards and government regulations. If you have any questions regarding the sample submission process or our advanced laboratory capabilities, please do not hesitate to contact us or email [email protected].